Whilst on holiday back at Easter time I ended up in a fabric shop in Edinburgh with my husband and brother in tow and I came back with some turquoise ponte knit and black and green stripey knit. I would just like to point out these are all made up now, I have posted about the black and green stripes yet but the turquoise ponte ended up in not one, but two Coco’s and a self drafted raglan top for the boy. 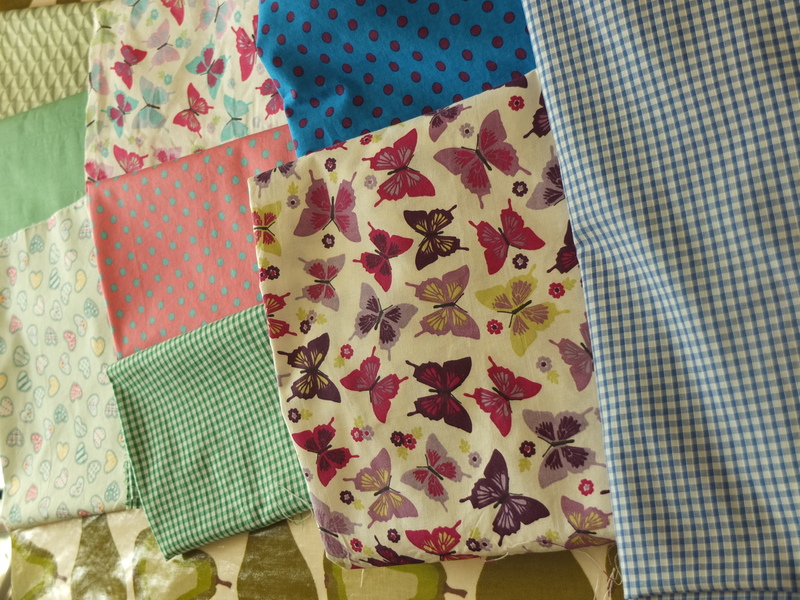 So, when I went away at the weekend I decided it was ok to buy some more fabric. Especially as I don’t have much dressmaking fabric in my stash. Maybe I should’ve specified how much more fabric I intended to buy. 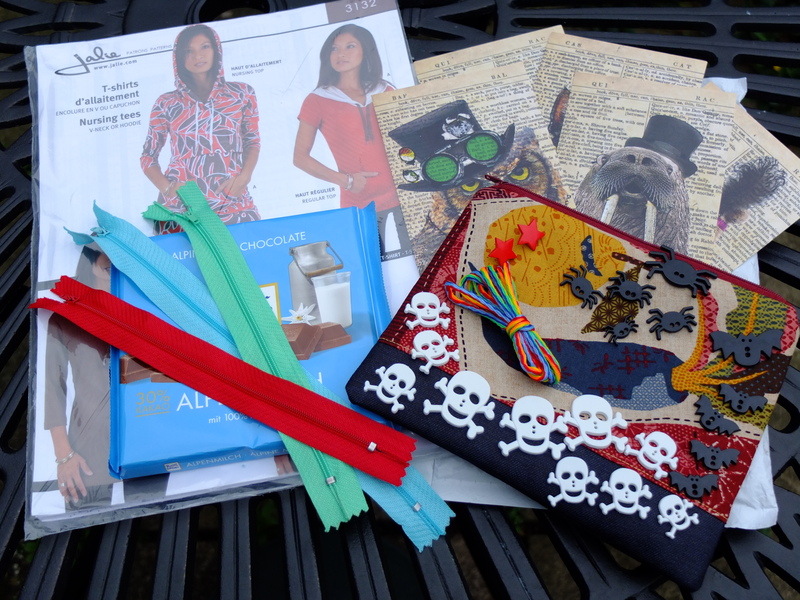 On Friday I was in Brighton, and before I went I just so happened to take a look at a review of fabric shops there on the Fehr Trade blog, so armed with that fore knowledge and with a little help from a local friend I ended up at Ditto Fabrics in the North Lanes. I found the organisation of the fabric in the shop a bit confusing, I couldn’t get my head around the logic of what stuff was together, which made it slightly harder to look, but the staff were happy to let me browse and left me in peace. 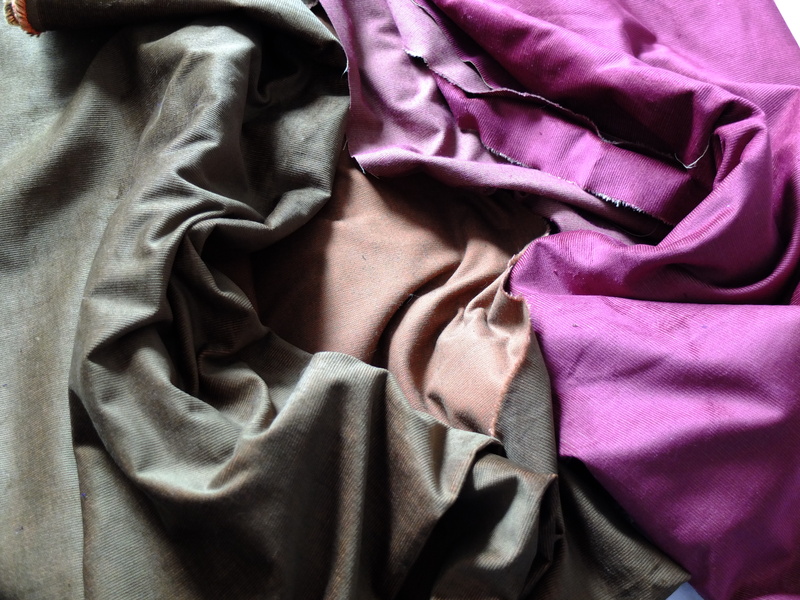 I came away with 4 lovely pieces of fabric. An indigo/black needle cord which is sooo soft it’s amazing. I looked for some needle cord locally the other day and the local choice in cord was a bit lacking, there was some, with a floral print on (the same stuff in my two main shops), which is a bit limiting (I am not a floral person). So I bought 3m of this as I figured that would give me something to play with and it’s fairly versatile in what I could make with it. Currently I think this would make a lovely shirt dress for me, maybe a Bluet and if there is any left I’m sure the boy would like a shirt in it. I’m not sure it’s strong enough for trousers though. I was also pleased to find some shot corduroy, I didn’t know this existed. I found some burgundy shot with green (the photo shows it as purple, which it isn’t) and was expressing my delight at the till, so one of the assistants found me out some of the same stuff in green (although the photo has come out more grey) shot with orange (from a completely different part of the shop). I was in corduroy heaven (clearly harking back to my days in academia). I’m thinking of something steampunky in a skirt for the green cord to wear when out with Countess Isabella’s Automata (time travelling victorian automata explorers who just happen to Molly dance). Finally, I got some knit fabric with a bit of wool in it. The main print is rectangles in lovely autumnal colours that remind me of a city skyline at night with all the skyscrapers with lights on. This is out of my comfort zone a bit but it was half price (making it £4 a metre) so I decided to go for it. I’m hoping not to have to use the border, which looks fine on it’s own, but doesn’t go with the main print, not helped by a slight white gap in between. I was thinking of making a shift dress type thing, with capped sleeves, that I could wear with tights/leggins and boots or over jeans and a long sleeved t shirt. My friend showed me a similar one she has in a similar kind of fabric, which had a cowl neck (which I don’t want) and big side pockets, which made me think of the Lola dress by Victory patterns, hmm…. Oh and I didn’t buy a dark teal ponte that was lovely, so I was a bit restrained. The shop was well worth a trip and they have an online shop too. I haven’t really bought fabric online as I don’t feel I understand the descriptions enough to know what I’m getting, but now I’ve been in maybe I’ll try it, they do have a fab range of corduroy. And I’ve just seen a navy cotton sateen with a white zig zag that varies in width on their inspiration page that is fabulous, know idea what I’d do with it though. 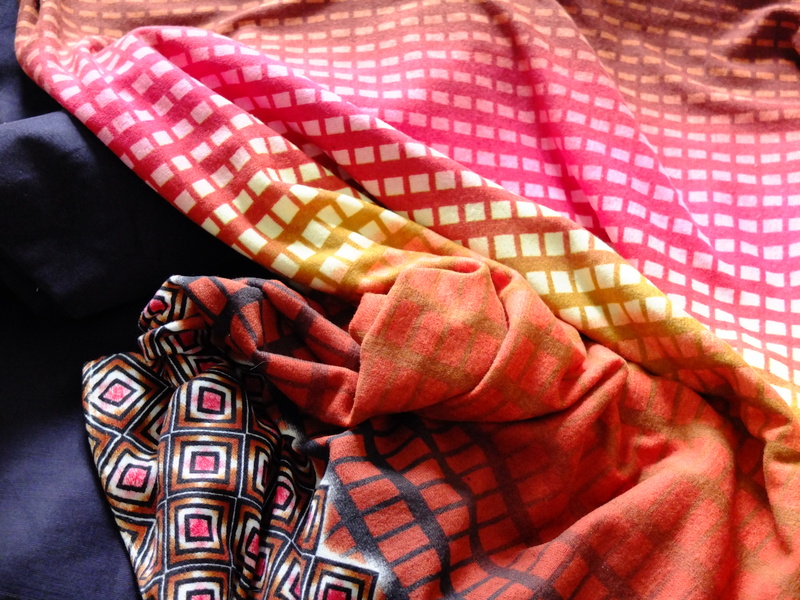 So, the next day, despite not really having time, I squeezed in a trip to fabric land on Western Road. I rushed around pretty quickly, it’s a big shop. There were a lot of assistants, some were more helpful than others (I could be jumping to conculusions but I suspect some were Saturday Assistants and still had some confidence to build and customer service skills to learn). They had a wide range of things, including swimsuit fabric which I’d only seen online before. I got 3 colours of ribbing (black, navy and grey – the only other colour was white, which is just asking for trouble) as I can’t get it locally and was pleased that they would sell me 1/4 m of each (my local shop wont sell less than 1/2m of anything). 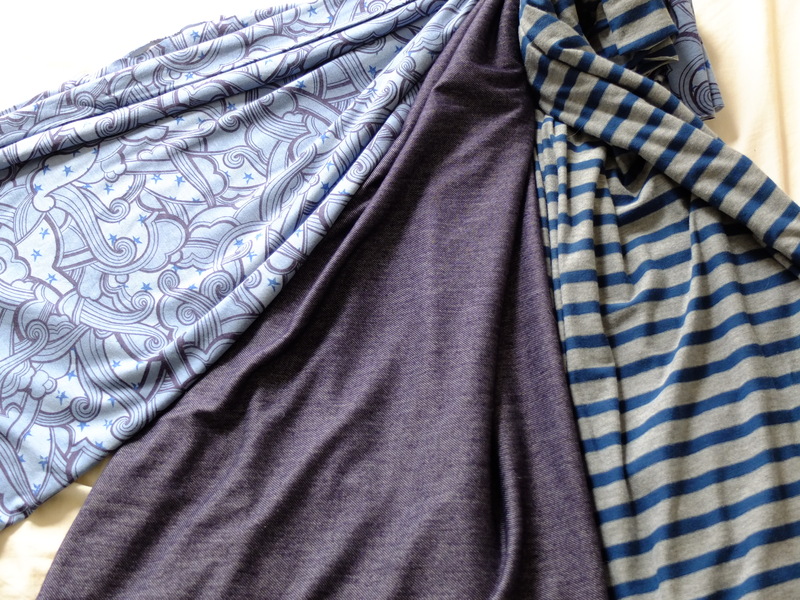 I also got 3 knit fabrics. I got 1m of each hoping that is enough to make a top for me (I really haven’t got the hang of figuring out how much fabric is needed for stuff yet, I’m always overestimating what I can get out of a piece of fabric and being disappointed, so on Friday I bought 2 and 3m lenths, which were feeling heavy in my backpack at this point). Then maybe there’ll be enough for a kiddie item too if I’m lucky and if I’m really unlucky I can always get a kiddie item out of each (surely, 1m is enough for that – my reserve back up plan is an adult t shirt pattern made from piecing different fabrics together that I have). There was a lovely grey and tealy-blue stripe, a blue with 70’s vibe cloud and star pattern and a denim effect one which is really soft (and for some reason I have decided to make a t shirt with a colour out of this, to replace the ancient one I cut up to make a witches dress for the girl. 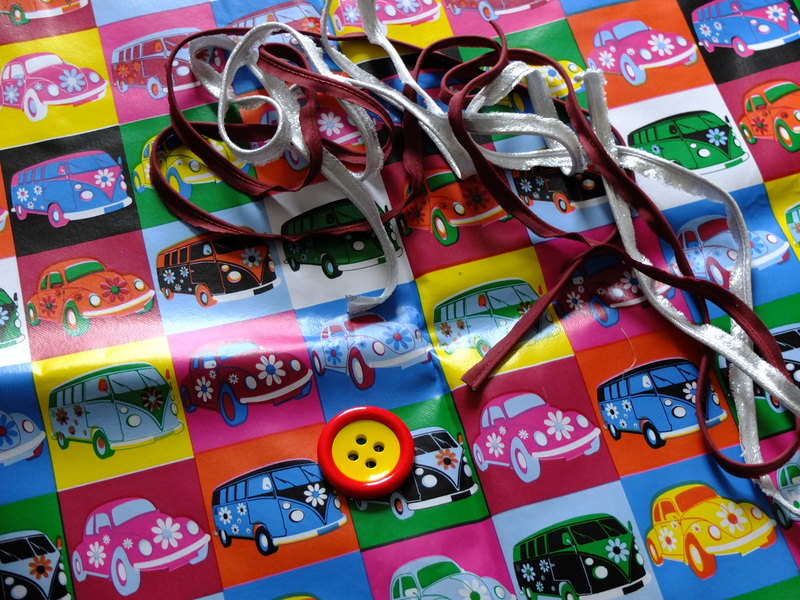 Finally, I couldn’t resist a metre of garish pvc table cloth type fabric (oh and some flanged piping). I also found out that they have a branch in Bristol, which is an easy shopping day trip away for me. This could be dangerous knowledge. Then I just caught my train to go and meet up with an old friend I haven’t seen in 20 years who just happens to be a sewing blogger too. Luckily we were in a small London commuter belt village with no access to sewing shops. 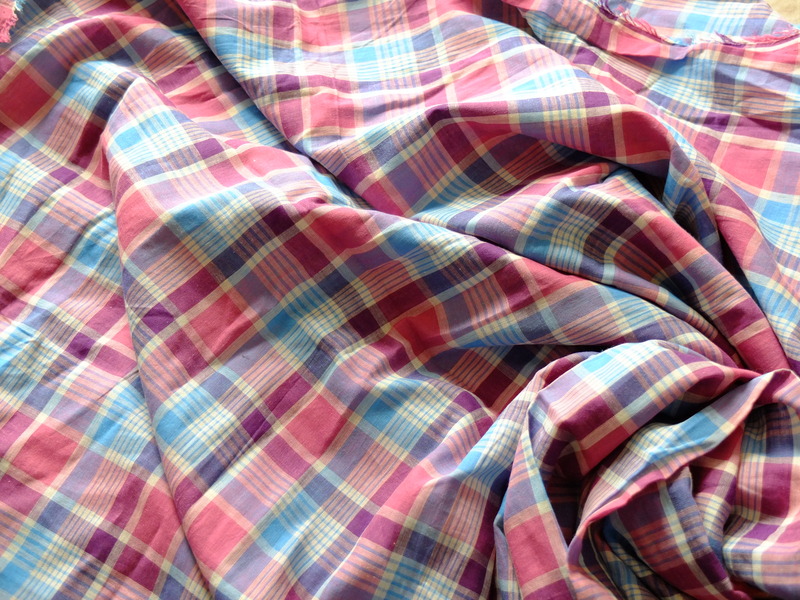 In theory this meant no more aquisitions but she gave me a piece of her stash, a beautiful coloured soft plaid. Not sure I know what I’m going to do with it yet, it makes me think of an Archer shirt, but I think it might be too sheer to be decent. It was very kind of her, especially as I didn’t finish the skirt I’m making for her in time to bring up. (I did bring up the pieces to show but we were bereft of pins for her to try on). So, I now have a much larger stash. 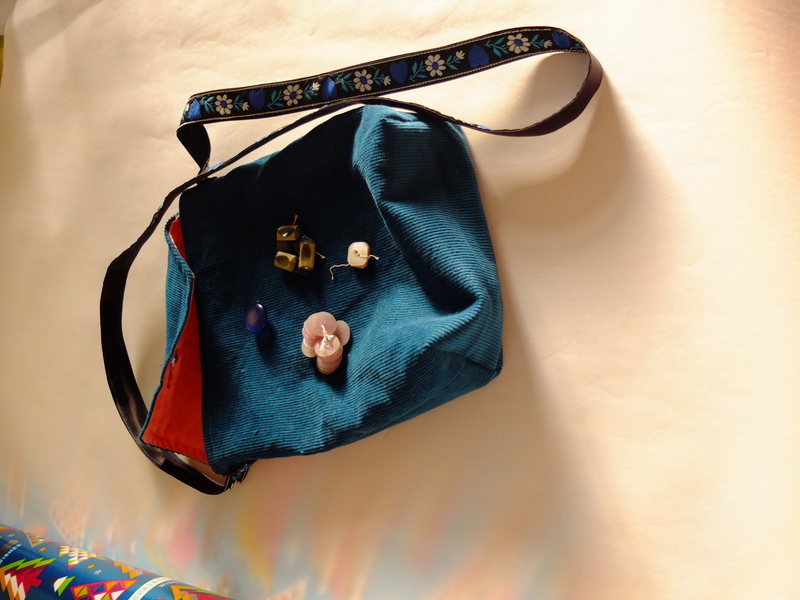 I have done some sewing too, but it has slowed down a bit as light hot evenings make settling kiddo’s difficult which has really squeezed my child free evening time when I tend to sew. Currently I’m working on something with this lot (which I bought locally). errm, yes, more fabric, most of them are only 1/2 m pieces though. If any Fabric First (as opposed to Pattern First) fabric buyers out there have any top tips on how to decide how much of something to buy, I’m all ears.